Even her most jaundiced critics admit that Leni Riefenstahl is the greatest female filmmaker of all time and/or the greatest documentary filmmaker of all time. But this is faint praise, since both fields are rather small. In truth, Riefenstahl is one of history’s greatest film directors, period, because of her strong aesthetic sense and countless technical innovations, which account for her immense and enduring influence. Her status as a director, moreover, rests on a very small body of work: two feature films, Das Blaue Licht (The Blue Light, 1934) and Tiefland (Lowlands, completed 1944, released 1954), and two documentaries: Triumph des Willens (Triumph of the Will, 1934) and Olympia (1938), released in two parts: Fest der Völker (Festival of Nations) and Fest der Schönheit (Festival of Beauty). In addition, Riefenstahl made three other documentaries. Der Sieg des Glaubens (Victory of Faith, 1933, 64 minutes), was a documentary of the National Socialist German Workers’ Party’s 1933 Nuremberg Rally, which was withdrawn after the 1934 purge of Ernst Röhm, who featured prominently in the movie. The other two documentaries were relatively short: Tag der Freiheit: Unsere Wehrmacht (Day of Freedom: Our Armed Forces, 1935, 28 minutes), and Impressionen unter Wasser (Impressions Under Water, 2002, 45 minutes). These documentaries, however, have been seldom seen and have had little influence on Riefestahl’s reputation. The fact that Riefenstahl’s stature as a filmmaker rests on only four films was not due to lack of effort on her part. After the Second World War, Riefenstahl tried repeatedly to launch new film projects, all of which came to naught, for one reason or another. But there is no question that an artist of Leni Riefenstahl’s talent would have made dozens of films in the 58 years she lived after World War II, if she had not been Adolf Hitler’s favorite director and if the Western movie business and media in general had not been dominated by Jews. The throttling of a talent this great is one of the aesthetic crimes of the 20th century. It is a reminder that Jewish cultural hegemony is maintained not merely by promoting decadent artists, regardless of their talent, but by suppressing healthy ones, regardless of their talent. It is also a reminder that all other values of the Left-wing coalition — feminism, gay rights, environmentalism, etc. — are always subordinated when they conflict with the overriding Jewish agenda of degrading and destroying the white race, especially those connected in any way with its most self-conscious and militant defenders so far. Do not miss Derek Hawthorne’s extensive analyses of each film, linked below. Riefenstahl also appears extensively in Ray Müller’s 1994 documentary The Wonderful, Horrible Life of Leni Riefenstahl . The director includes candid footage, shot when Riefenstahl did not think she was being filmed. His intention was to make her look bad, but in truth she comes off as 100 times the director Müller is. It is required watching, despite the inevitable axe-grinding. Published: August 22, 2013 | This entry was posted in North American New Right and tagged articles, commemorations, Greg Johnson, Leni Riefenstahl, movie reviews, North American New Right, originals, the Jewish question. Both comments and trackbacks are currently closed. Every time that Leni came to visit New York City in the 70’s, she could always count on a warm welcome from someone who had great admiration for her. That was Andy Warhole. He did not care what the countless liberals thought of his friendship with Leni. Her great work as and artist overshadowed everything. I love Triumph des Willens, watched it recently. If ony she would have been able to shoot her “Penthesilea”. Back in 2000, I found Ms Riefenstahl’s address on the internet. I wrote to her and told her that she was a truly great artist in many areas and for her to ignore all of the criticism from those who wish to ruin her life. I also told her that I was impressed with her extensive work with environmental issues. I told her that God has a special place for those who care for the planet. She wrote back to me and signed an old photo, which I immediately had framed. I still have it to this day. I did much the same thing in 2000, and received a signed photo as well which is one of my treasured possessions. I, too, wrote to Leni Riefenstahl on the 21st of August 2003, but only via e-mail. Unfortunately, I didn’t have her postal address. Soon after I met someone in the Bavarian Forest who knew her very well, but at that time she had already passed away. Her grave lies, as far as I know, in Munich, Ostfriedhof. Last year I read her Autobiography which is fascinating (I didn’t notice the disingenuous parts alluded to above). I have a picture of her on my desk and only two people out of hundreds recognized her in several years. Some asked who that was and didn’t know the name Riefenstahl. One of the two who recognized her sponaneously was a Jewess who said: “You have h e r picture? !” She is apparently known amongst them. This is interesting, both because she is known amongst the Jews and not known amongst the non-Jews. This has to change. I also saw twice the puerile film of the accusatory and know-it-all-better Ray(mund) Müller. He is what in German would be called an “Umerziehungslümmel”, a re-educated churl. “Re-education”, this monstrously insolent expression of hybris, casually thought out by a Jew, was intended to radically cut off Germans from their traditions, alter the national character, alienate them from their culture and make the Germans themselves abhor and loath their own nation. Müller surely has imbibed that lesson of humiliation and self-debasement. I wonder whether he ever re-thought his embarrassing position after being in contact with Leni Riefenstahl who so easily looked great in this film. The film also exemplifies modern productions: They need something that can be exploited for the lack of any solid topic of one’s own. 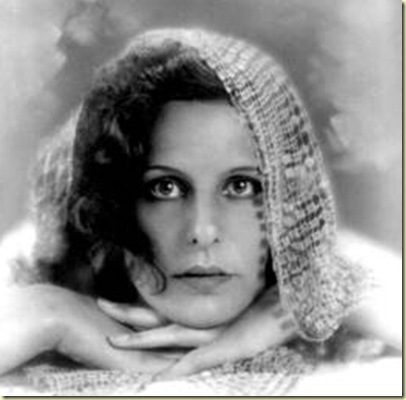 I admire Leni Riefenstahl. She will always be one of the few who shine from the summit of accomplishment. Only by unceasing denigration on the one hand, and wherever possible, not mentioning her on the other, will her name be marginalized. But this requires ever more energy for all foreseeable future and at this her enemies-our enemies- will eventually falter. That’s curious, I too had her picture on a kitchen desk, the beautiful iconic portrait from “The Blue Light”, and the only person who ever recognized her was Jewish as well. “But… wasn’t she a Nazi pig? ?” She exclaimed. “Not as much as Eisenstein was a commie swine”, I answered, pointing to a postcard of “Battleship Potemkin” I had on the wall as well. I always wondered how commie art was universally considered to be non-controversial and inoffensive. By 2003, I was already convinced she would never die, I thought she was way too old for that already. Just a few years before she had survived a plane crash. It was fascinating to think that she STILL was around, giving interviews, answering fan mail… same thing with Ernst Jünger, who died aged 103. My, she is a beautiful woman! With talent too!